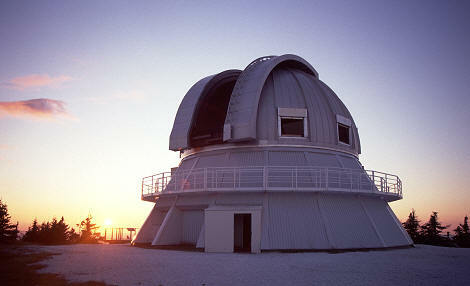 The Observatoire du Mont Mégantic (OMM), one of the components of the CRAQ, is equipped with a 1.6m Ritchey-Chrétien telescope. The OMM, the largest telescope in the eastern North America, is located on the Mont Mégantic summit (1111 metres), in the Eastern Townships near Sherbrooke, QC, about 250 km from Montréal and Québec City. Despite the modest size of its primary mirror, the numerous instruments available for observations (see list below) make the OMM one of the most versatile telescope in the world. These instruments offer the possibilities of performing imagery, spectroscopic and polarimetric observations both in the optical and infrared. For more information about the OMM, visit the OMM web page (in French) or please contact the executive director Robert Lamontagne (lamont@astro.umontreal.ca).